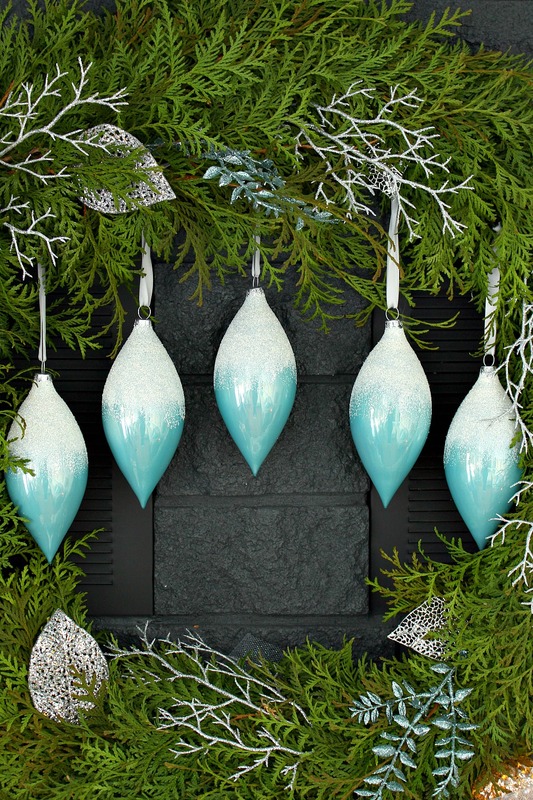 I’m thrilled to be collaborating with Lowe’s Canada to do some blue and white holiday decorating in the lakehouse. I’m keeping the look wintry and sparkly – no Christmas tree and no red or green to be found. 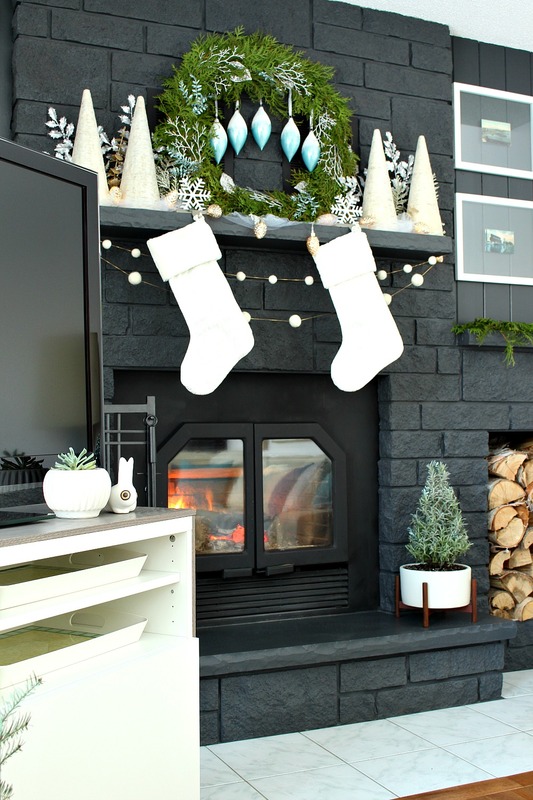 The Lowe’s Cold Spell holiday collection looks like it was made for the lakehouse! 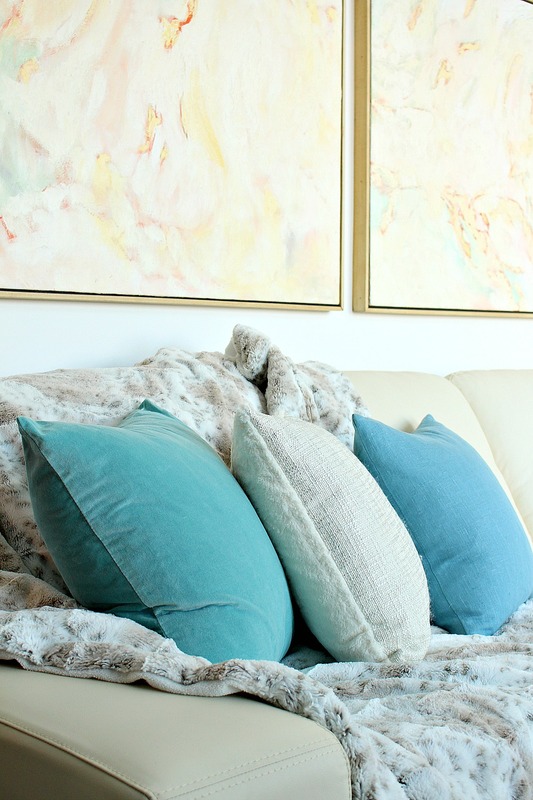 The colour palette consists of icy blues, creamy whites and tons of silver. 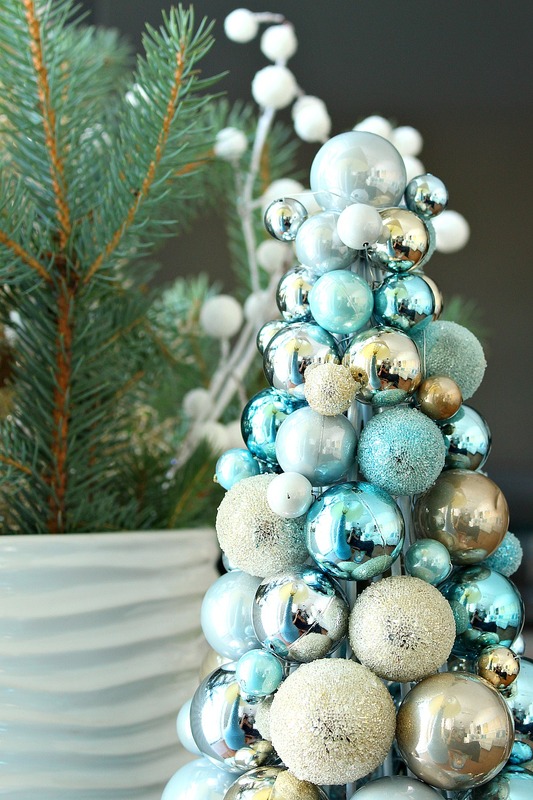 Let’s take a tour of my wintry blue and decorating holiday ideas! My narrow mantle is tricky to decorate but, even with the limited space, I created a really sparkly, layered mantlescape this year. I started with glittery tulle from the fabric shop (I bought a metre, which I cut in half lengthwise). I scrunched that up on the mantle and then placed a fresh cedar wreath I made in the centre, casually leaning it against the brick. I made it using the same wreath form (and the same steps) as last year’s fresh greenery wreath, but the cedar really lasts much longer. Once again, I added some faux foliage in shades of blue and white, along with some silver leaves. 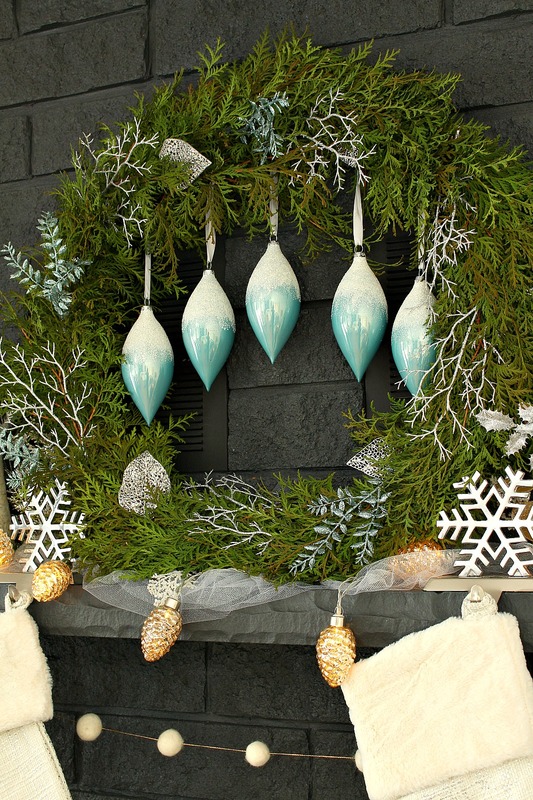 Using ornament hooks, I attached a row of vintage inspired pale blue ornaments to complete the wreath. 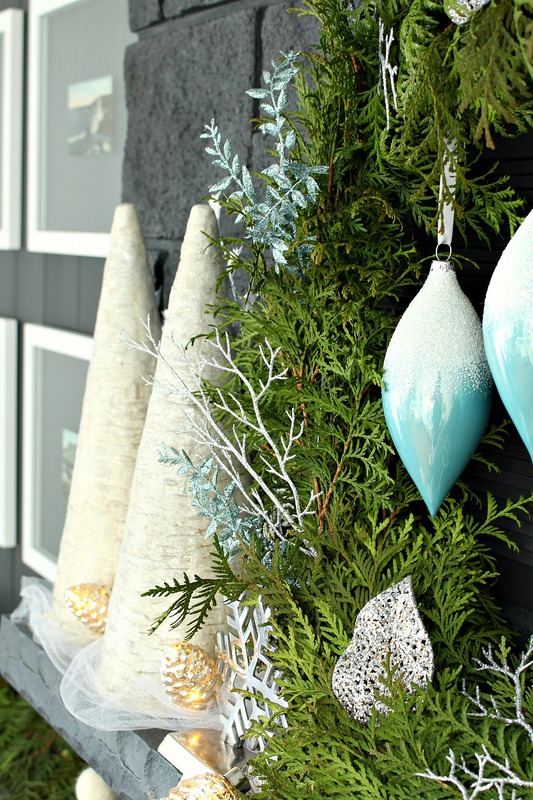 Using my easy DIY felted ball tutorial, I quickly whipped up a felted ball garland that looks like snowballs – perfect for my wintry blue and white holiday decorating vibe! 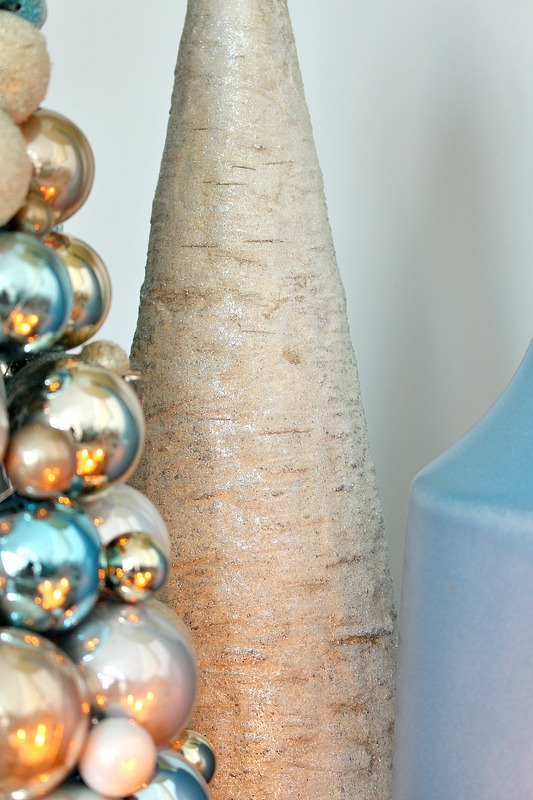 I flanked the wreath on either side with two faux birch bark cone-shaped trees – they have such a pretty shimmer to them and a minimalist, Scandinavian-inspired vibe. 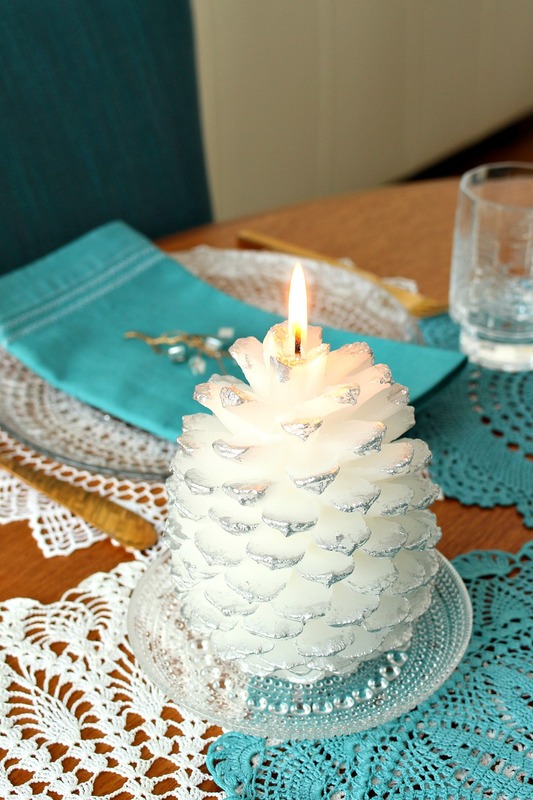 I wove a string of battery operated pine cone shaped lights around everything to add some glow. 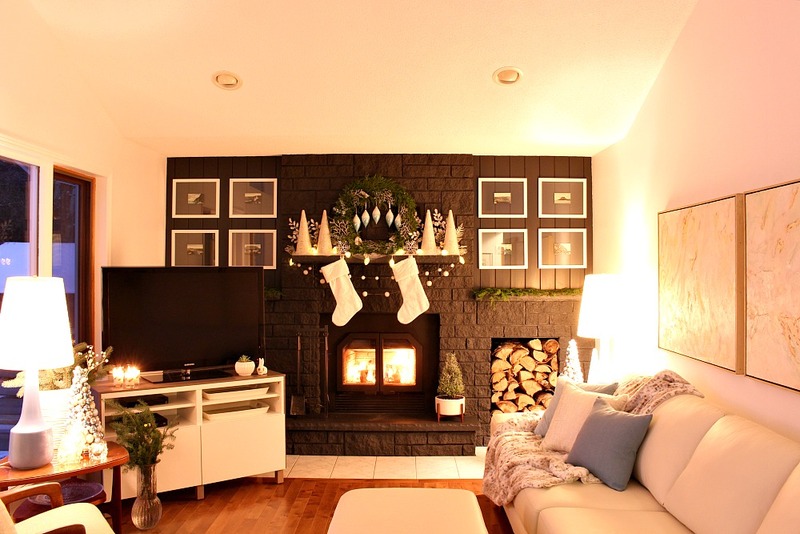 I also tucked in some sparkly faux foliage to add a little more sparkle and interest – the light faux stems and trees really pop against my dark fireplace. My Mummu is an avid crafter, so I raided her collection, but Lowe’s also carries this type of glittering pick (which they tuck into their display Christmas trees – such a pretty idea). 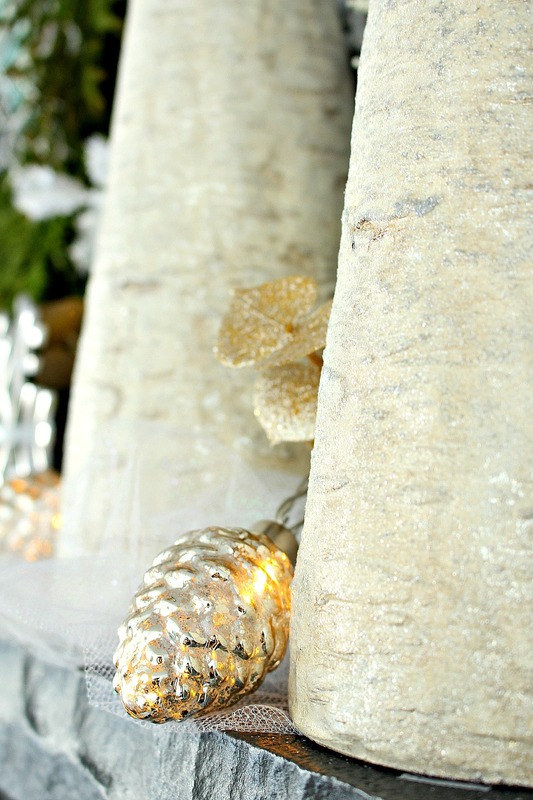 Look at these faux birch bark trees shimmer! 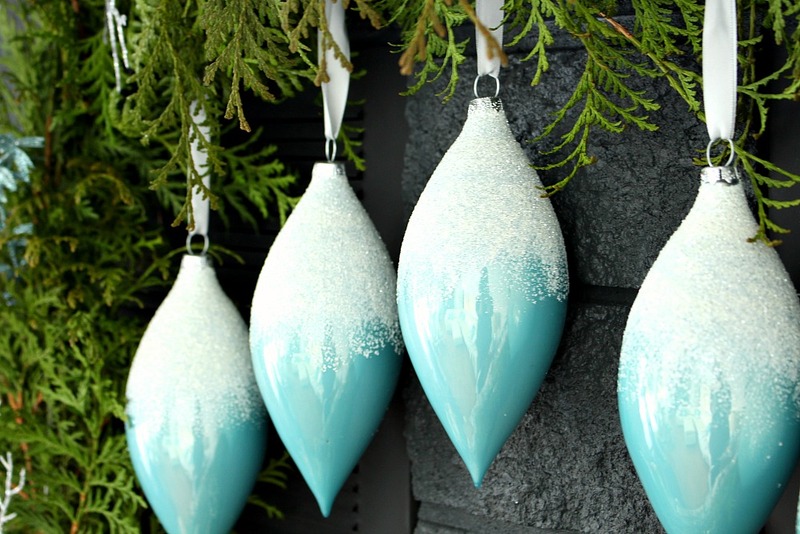 When they’re placed beside string lights or candles, they just gleam like freshly fallen snow. I’m really tempted to find a place to display a grouping of these all year round. One of the fabrics used in the Cold Spell theme (for stockings, throw pillows, and a tree skirt) has such a mid-century modern vibe that I just had to bring home some pieces. 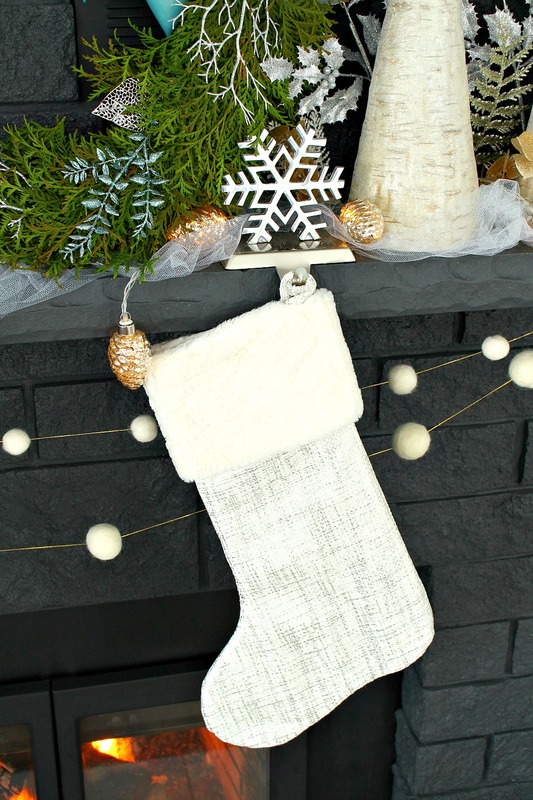 You know my obsession with tweed; the stockings and throw pillows look like a creamy tweed shot with silver. To me, this fabric just feels wintry – it doesn’t scream “Christmas,” which I like because you could totally put these out in November and keep them until the snow melts (I plan to)! As I was leaving Lowe’s, I spotted a rack of tree-shaped lavender plants (along with more classic choices, like poinsettias and Christmas cacti). 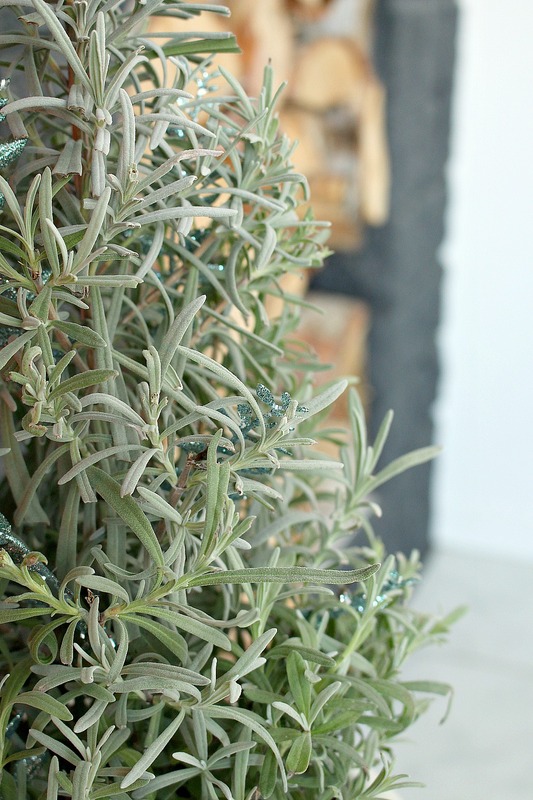 These smell amazing, and are so different, so I brought one home and planted it in a mid-century modern-inspired tabletop planter from Modernica. It looks so cute on my hearth, but I’ll move it to the dining room table for everyday use. You have to keep pruning it to maintain the tree shape, so after the holidays I can let it grow out. 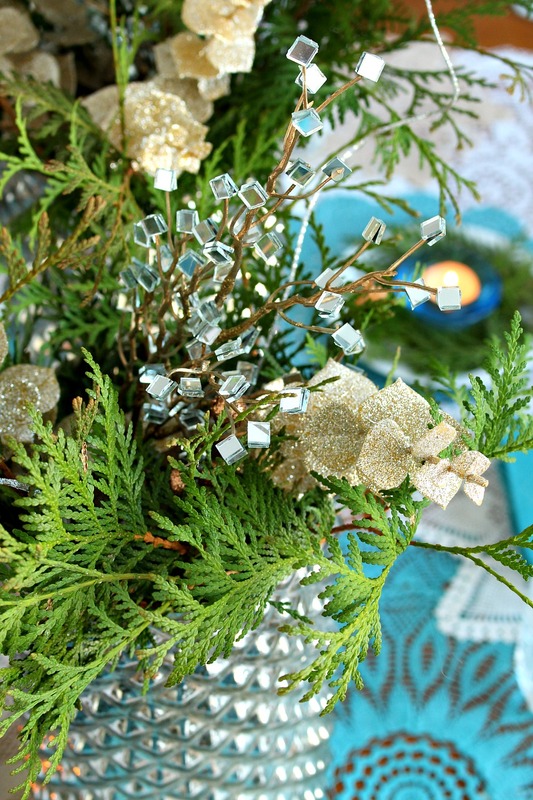 To make it a little more festive – and to keep with my wintry blue and white holiday decorating scheme – I just tucked in some glittering faux foliage stems. With our 20-ft sectional sofa, we don’t have much room for other furniture – or display space – but I made the most of our accent tables and swapped my usual plants for a vase with fresh blue spruce boughs, a tabletop ball tree from Lowe’s, and some other cozier accents like a light-up owl and assortment of candles. 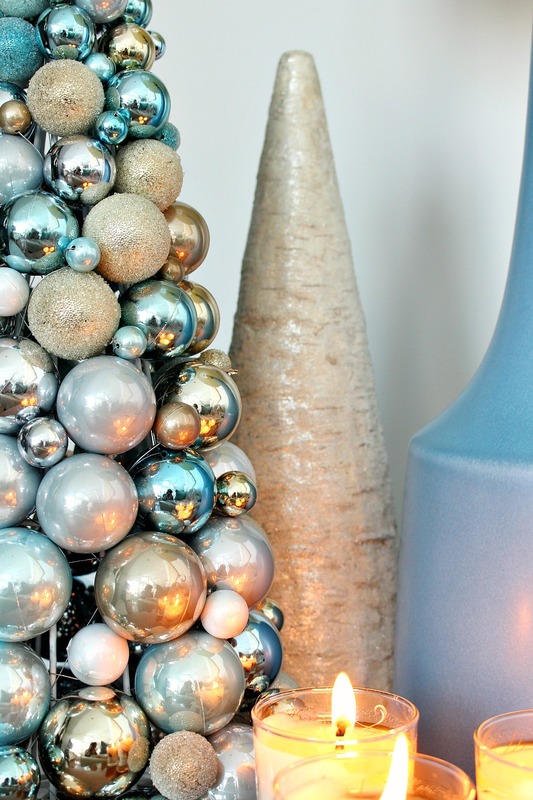 Moving over to the dining room, I mixed some new pieces from Lowe’s with some of my existing holiday decor to carry the wintry blue and white holiday decorating ideas into my tablscape. 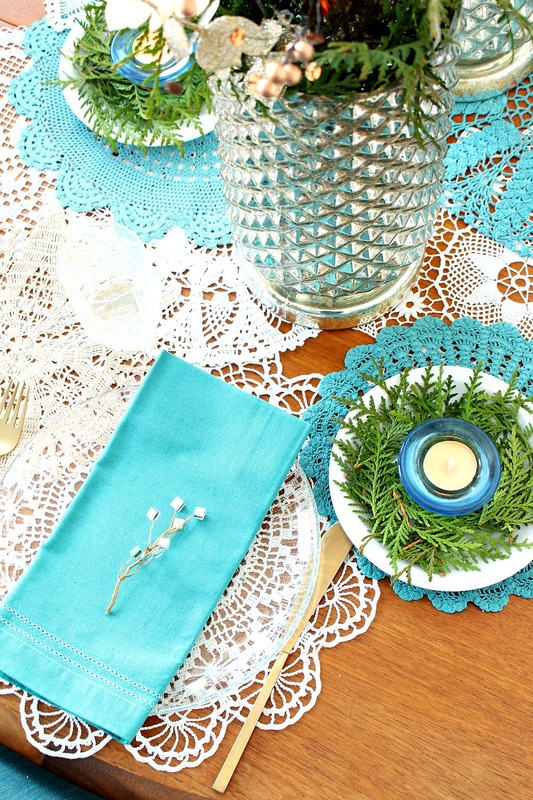 Last year I dyed some vintage crochet doilies teal, along with some matching linen napkins, and I loved how that looked. 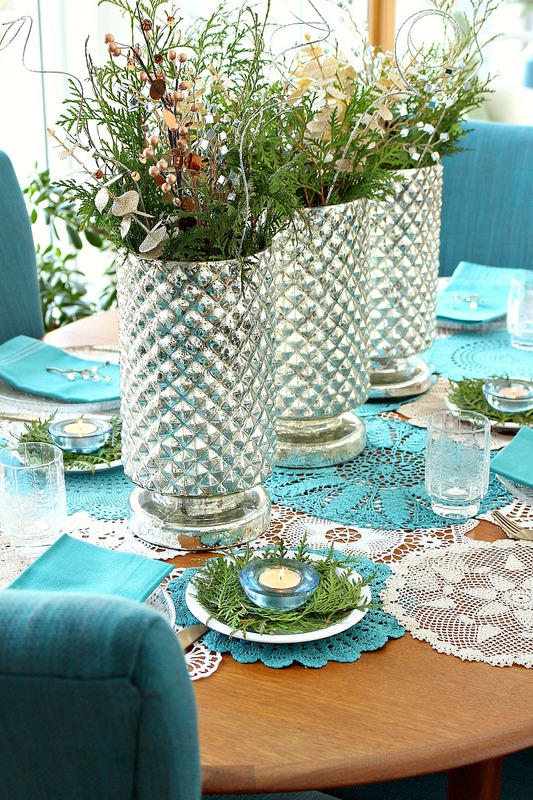 The lacy doilies complement a wintry tablescape so well, so I used this makeshift runner idea again, this time with some wintry glass plates and glasses. 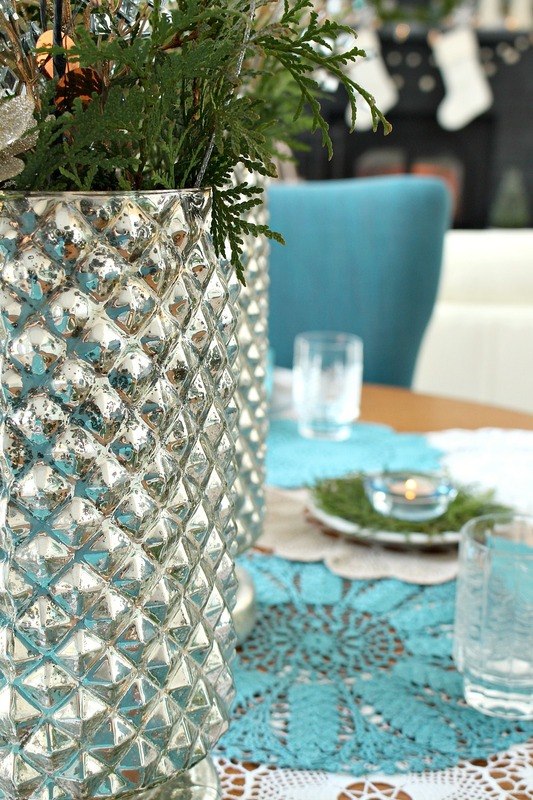 The mercury glass vases from Lowe’s come in two sizes. For a centrepiece, I recommend the shorter size. I chose this larger size because I knew it would photograph better, but for real life, the taller size is perfect for a mantle, end table, or sideboard, while the lower size is great for a centrepiece that allows you to still see your guests over dinner! To create a budget-friendly arrangement, I used natural cedar greenery from my backyard along with some more faux foliage picks. Once you invest in some glittering picks, they can be used every year to add sparkle to a green (and free!) 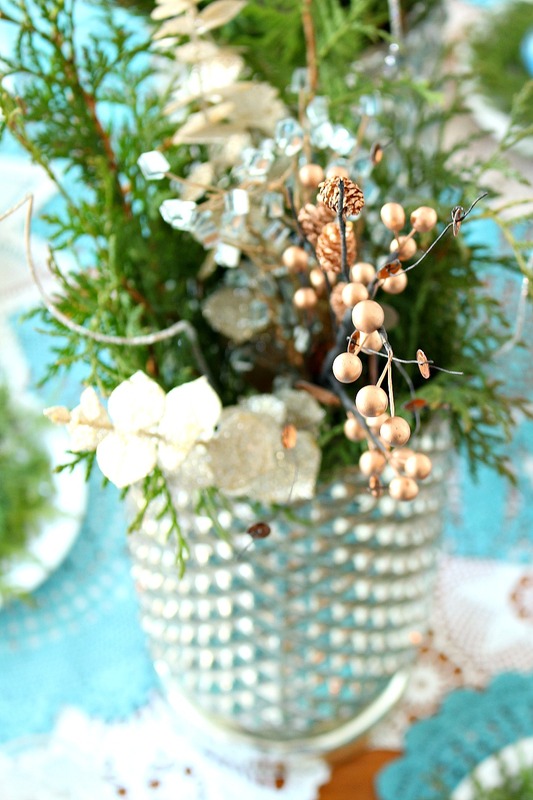 arrangement, helping to keep a holiday decorating budget in check by saving money on flowers. To create more ambiance, I added a small plate to each place setting and nestled a pretty blue glass votive holder into a bed of cedar. I also added a pretty glittering stem to each napkin for some more sparkle. We had our first snowstorm recently and it was so bizarre to go from unseasonably warm fall days to WINTER overnight. The temperature plummeted, cars drove off the highway into the ditch, and we had to pull out our deep freeze parkas. I immediately started craving cozy comforts: the fireplace, candles, blankets, (and pie!). 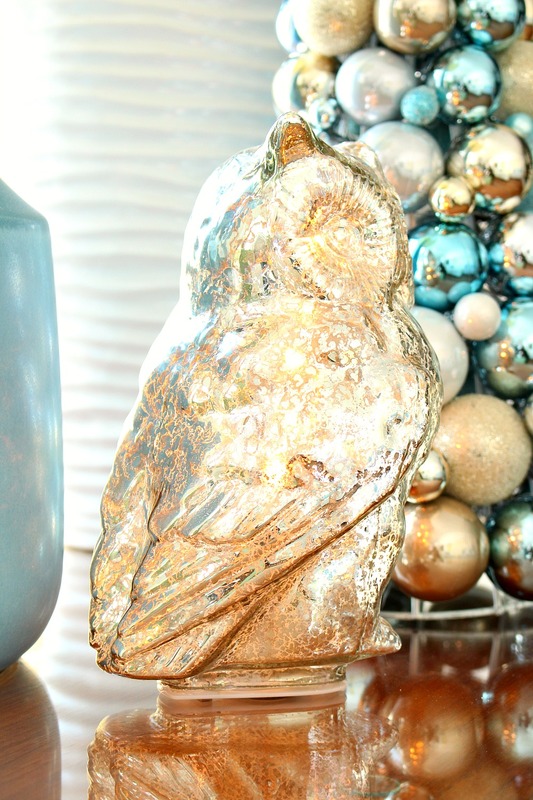 Adding new touches, like those battery-operated pine cone lights and that adorable owl really added another layer of coziness. 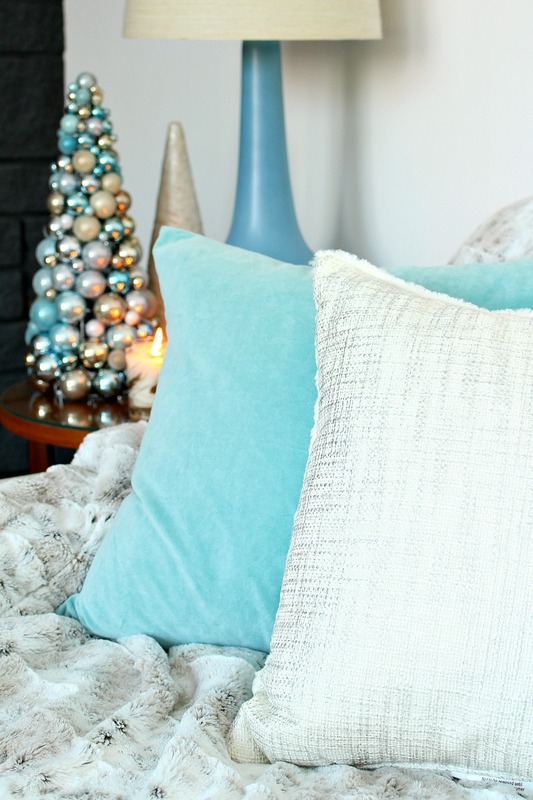 Look how lovely the living room looks at night – this wintry blue and white holiday decorating palette is perfect! Well, I’m officially ready for evenings in, huddled under a blanket watching movies. How about you? This post was sponsored by Lowe’s, but all thoughts, opinions and styling choices – including the decision to highlight products from the Cold Spell collection – are my own. 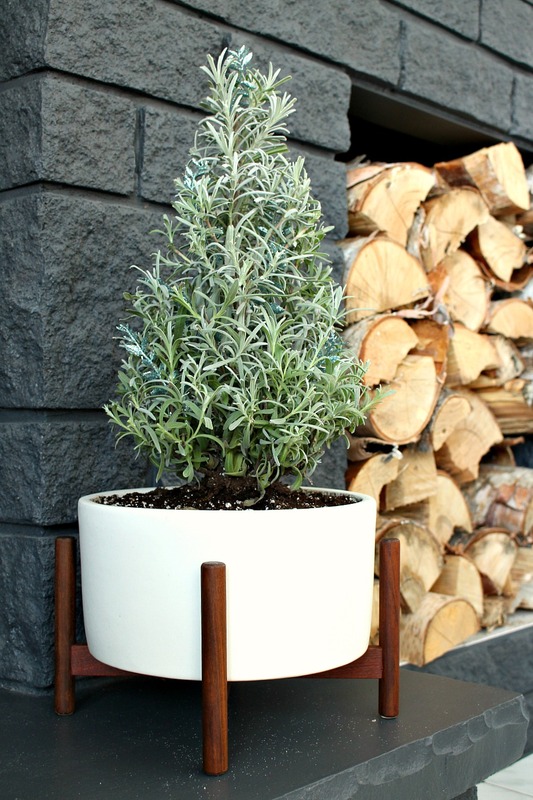 The case study planter was provided by Modernica. Happy holiday decorating, everyone! 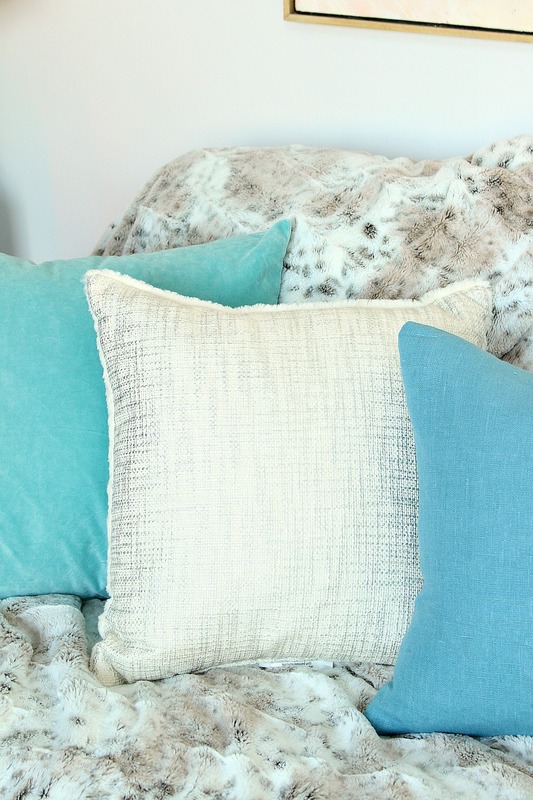 Previous Post 20 Modern DIY Project Ideas to Dye For | How to Dye Anything! Well, you motivated me to go to lowes this week. I am in need of new, cohesive decorations. The kitchen mantel will be Lego Star Wars advent pieces per my sons request. I am thinking the retro look for the cabin. bTW- Your links didn't work for me but I wonder if that is because I am in the US? Hi Heather! Definitely check out your Lowe's. My links are headed toward the Lowe's Canada website, so that might be why they don't work for you. I checked a few and they work for me, but I'll go through them all just to be sure. I'm not sure what the US Lowe's has. The collections might be different, but I have been really impressed with the quality of the decor so even if the selection is different, I hope you find something great. Although your kitchen mantle sounds really fun!! That is the cutest holiday request ever. I went through them all and a few of them aren't working so I've reached out to Lowe's and hopefully we can get it sorted out. Thanks for the head's up! I checked with Lowes, they aren't available in the US. Of course! You can't buy online and ship them to a US address either. Such a bummer!! My Canadian readers should LOVE this because it's usually the other way around: retailers save the cutest things for the US market! I get so many complaints about not having more content for my Canadian friends, lol. 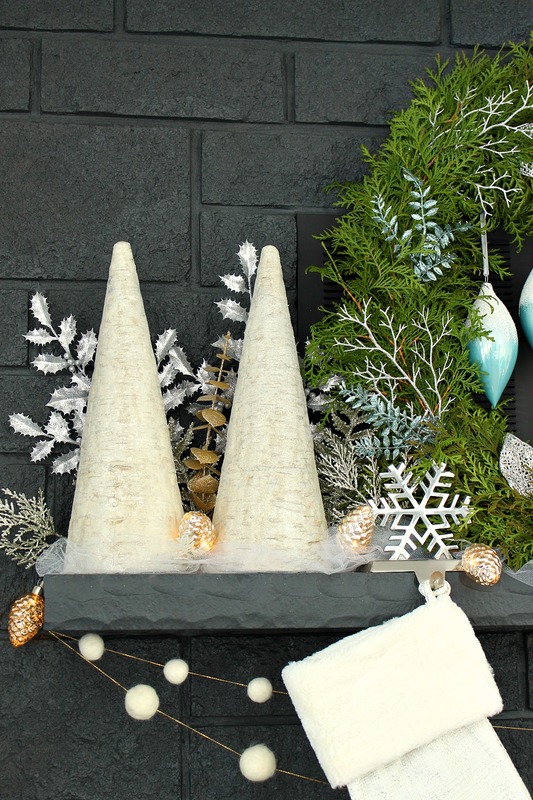 Hopefully the US Lowe's will take note and bring in some adorable holiday decor ASAP. You must have selected the best available at Lowes, because it all came together so well. It's definitely seasonal, holiday festive, and very lakehouse-ish. I hope to see photos as you later transition this collecction to New Year's, and then to post-holiday winter. Very, very nice. Thank you! I have to say that all four of the Lowe's collections are SO pretty! One theme had pretty, modern woodland accessories I loved and another had beautiful modern brass pieces. They really knocked it out of the park, but this theme was so perfect with my decor. It's why I decided to collaborate with them for the holidays, it just looked so right. My trip to Lowes was disappointing, very little selection :(. I did get three of the silvery trees and a matching hurricane lamp. Thanks Amy! I have a few more holiday DIY projects to tackle but I need to dig deep and find the motivation. It started raining like crazy yesterday and almost all of our snow is gone. Have you gotten this weird weather too? It's making me feel like spring is coming, lol. As long as it doesn't turn to glare ice, I can't complain! Thank you Heather! That means so much to me because I just LOVE your colorful style. I would happily come decorate! Lovely! I agree that home improvement stores are fantastic. My husband and I call them "toy stores!" Where did you get the vase the rosemary is in? The lavender plant? If that's the one, it's from Modernica. I've got a link at the very bottom of the post. I have three now and I love them so much. 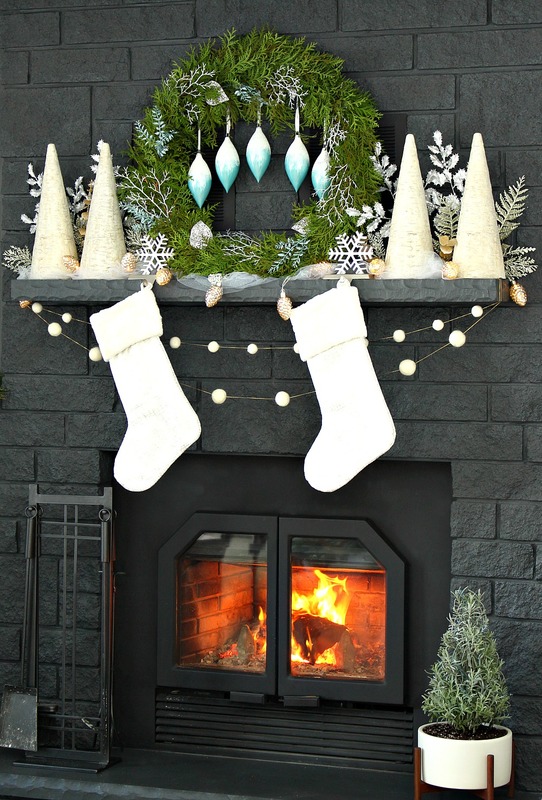 Hello, what color paint did you use for the fireplace?